Farewell 2011 - hello 2012. The end of another year and, of course, the beginning of a new one. I hope that, like us, you are looking forward with great optimism although I suspect that 2012 is not going to be a good year for most of us and I will admit that our optimism is tinged with more than a touch of bravado. 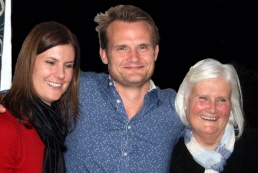 One of the problems of Marcia’s international success is that we have friends (for her readers soon become our friends) in so many places that when disaster strikes – whether through man’s activities or natural events – the chances are we shall be worrying about some particular family or even families. That was the case when eastern Australia was hit by flooding and when Christchurch in News Zealand was devastated yet again by earthquakes. It was true when floods hit the USA back in May and Thailand during November where we have relatives as well as friends. Here in the UK and in other countries in Europe there have been similar problems. It would seem that the effect of global warming is to introduce more energy into the weather with strong winds and heavy rainfall becoming more frequent. Having said all that, what a contrast to this time last year when it was bitterly cold and the garden covered in snow. This winter has been so mild that nature seems to have lost track of time. We have gazanias – which should have died ages ago - still in flower whilst some of the azaleas (not due to flower until the beginning of February) are already putting on a brave show. It will be interesting to see what happens if this first flush is killed off by frost. Will there be a second flowering at the proper time? A close look reveals that not all the buds are now open so that is a possibility. 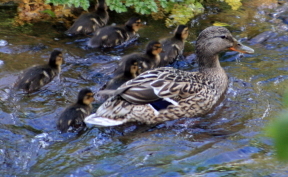 Even madder: a friend reported seeing some ducklings on the river down in the valley below us. What will become of them I really don’t know. Christmas this year was rather special. Many of you will know that Marcia’s oldest and closest friend is Susie. She is a community nurse who works in north Cornwall about a thirty minute drive away. Although she is semi-retired she was working last Friday, Saturday and Sunday (Christmas Day – only a few visits in the morning but she was on call until 10 pm). Ages ago it was arranged that she would be staying with us from the Friday evening through to Boxing Day. Towards the end of November, an email arrived from Sam: Susie’s son, Marcia’s godson, now living with his wife in Australia. As his mum was going to be with us, could they come and stay Christmas Day night, please? Not a word to Suzie in case it didn’t happen. Well, what can you say? A week later we received a second email. This one was from Emma: Susie’s daughter who lives in Switzerland. As mum and Sam were going to be with us for Christmas. Could she and Toby come too? As an incentive she would make a Christmas pudding. So it was that there were seven of us around our table that day. Of late Marcia and I have been trying to decide whether or not the time has come for us to think about moving into a smaller house. Although there are just the two of us here for most of the time and we do rattle around a bit there are times, like this, when we are glad of all the space and that we have a huge kitchen with a table that can easily accommodate eight. We shall be just as glad again later on today when our son and his family arrive to stay. Having been very busy over Advent and Christmastide, he will be glad to be away from his parish recharging his batteries and having them with us over the New Year always makes up for the fact that we don’t see them on Christmas Day itself. May I take this opportunity to wish you all a peaceful and healthy New Year but before you go take a look at the picture below. 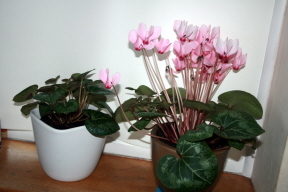 This is a tale of two cyclamen. Both are two years old. Both did wonderfully last winter. Both spent the summer together in the potting shed. Both were re-potted at the same time and into the same potting medium. The one on the right is fantastic - the other quite miserable (although it might get there, eventually). Now, why are they so different? If you think you know, please leave a comment with your ideas. Last Saturday we went back to the village of Avonwick where we used to live to join a lot of old friends for lunch. The daughter of one of Marcia’s very close friends was married a few weeks ago and this lunch was to celebrate that event. Not only were we able to meet her new husband – a thoroughly delightful man – but also catch up with old friends. It being some ten years since we have seen most of them, it is hardly surprising that they (and, no doubt, we) were all looking older. As one pal put it when talking about old age, ‘Funny, when we were younger we just never thought it would happen to us.’ Am I surprised that so many of us continue to work or remain as busy as always? Not really. Most us seem to me to be pretty young at heart and I suspect that is, in part at least, because we are all busy and continue to be interested in what is going on around us. Coming back over Dartmoor we had a huge stroke of luck – and in a place I would not have expected it to happen. We were driving up towards Lee Moor and Wotter and had crossed over Quick Bridge and were approaching Tinpark Farm (now a riding establishment) when a three hinds jumped into the road from the scrubby woodland of Cholwich Town Bottom and up into the fields on our left. I grabbed a camera and, thanks to their usual moment of curiosity before bounding away, was able to record the moment (although I’m afraid one is somewhat out of focus). The light as we crossed the High Moors was quite incredible. Unfortunately the best photos would have been with the jagged top of Pew Tor against a flaring cloud-wracked sky but it was not to be. We were in the middle of a stream of cars with more coming towards us and so to stop would have been impossible. By the time we could, the sky had completely changed and there was no point in retracing our steps. Still, the ones I did get were reasonable. The rest of the week has been uneventful – if you ignore the weather. We have been hit by everything going (including the first snowfall of the winter) but have been counting our blessings - we have friends who live up on the banks of the River Clyde in Scotland where the winds have reached over 150 miles an hour - but, I can’t help but be glad that in a few days the evenings will start to draw out once again. Meanwhile, I am pleased to report that the next book makes steady (if slow) progress despite all the distractions that we have at this time of the year. I am putting this up on Thursday evening as tomorrow is outrageously busy. Apart from other appointments, I have one with the optician. The laser treatment has been satisfactorily concluded and so I can now have new glasses. Will I be able to drive again? Tune in again next Friday to find out. Are there marshes on the River Tamar? Those who have read ‘Those Who Serve’ will know that Cass and Kate are lifelong friends. In ‘The Courtyard’ we learn that one of Kate’s sons, Guy, becomes attached to Gemma, Cass’s daughter. We next see them in ‘The Birdcage’ when they are staying on Exmoor because Guy wants to go sailing with a client who is keeping his boat at Porlock Weir and Gemma . . . Well, Gemma (who is, after all, her mother’s daughter) wants to play around with an old boy friend. The last time we heard anything about them was in ‘Echoes of the Dance’. Gemma is seen with her lover and Guy finds out. Actually in this instance Gemma has behaved very properly but Guy has lost trust. In the end he decides that the only way the marriage can be held together is to move to Canada where his father, Mark, now owns a boat building business and so the couple with their two small sons leave the UK for a new life on Prince Edward Isle off the east coast of Canada. Porlock Weir at low tide. Cass and Kate, now of course grandmothers, are sure that Guy and his father will find working together very difficult; both being reserved, austere and often short tempered. Equally worrying is the thought that Gemma, fun loving and highly sociable like her mother, will be lonely and deeply unhappy in such a remote location. Then they receive the news that Gemma is returning to the UK with the boys. How are the grandmothers, friends for life, going to cope? For many years Marcia has been aware that sooner or later she would be faced with exploring that situation and the resulting book was dubbed ‘The Grandmothers’ Book’. Having said that, Marcia had two reasons for not wanting to write the book. First: she was certain that there would not be enough in this story to make a book so it would have to be a part of something else into which it fell quite naturally – but what could that be? Second: since it took her right back to the very first book she wrote she had a feeling that if she wrote ‘The Grandmothers’ Book’ that would be the last one. Nevertheless, we have spent many hours talking this through over a number of years and Marcia has written pages and pages of notes on the subject. There was a further difficulty. Historically I had driven Marcia around to find and then explore the areas in which her books are set. The game plan was to start on this early in 2010. However, four days before New Year’s Day the problems I had been having with my eyes went critical when the retina in my right eye became completely detached. Until then my right eye was the one I really used as the left was (and is) pretty poor. The retina was glued back in place on New Year’s Eve but it was going to be a long time before I would feel confident to drive. Meanwhile, saying nothing to me about it at all, Marcia had come to the conclusion that the next book – possibly ‘The Grandmothers’ Book’ - would be set on a marsh beside a fairly big river. She had convinced herself that there was no such location and so was trying to put it to the back of her mind. In those days we used to do the Times 2 crossword (the easy one) as we ate breakfast and the answer to one clue was clearly either ‘sedge’ or ‘marsh’. Marcia suggested sedge because she was still shying away from this setting near a marsh. ‘Are there any marshes on the River Tamar?’ she asked, all innocence. Even then she wouldn’t say anything but after lunch she proposed that we drove down to the Tamar ‘just for a jolly’. So we did. And we saw the marshes. And it was bitterly cold. And the sun shone brightly. And the tide was out. And there was this huge expanse of mud. And there were salt marshes. And it was wonderful. And there was this huge expanse of mud with a few shelduck and a solitary gull enjoying an afternoon snack. A curlew with its long bill. Taken a few weeks later but it was still pretty chilly. This time the tide was in. The next day we crossed over into Cornwall and explored the other side of the river. That was great too – although Jossie slipped into a very muddy channel which was quite interesting. On the way back Marcia suddenly stopped the car. Thus on the very first trip we found the setting for ‘The Sea Garden’ - and it was all because of two clues in that morning’s Times 2. Isn’t life odd? Today Marcia has been to Trematon Hall which is just inside Cornwall to the north west of Saltash where she gave a talk as part of the Saltash Book Shop’s ‛Authors Day’ event. About a hundred people were in the room and I understand that a good number of them asked questions when Marcia had finished speaking. Anyway, what with one thing and another – including preparing for this event – we haven’t done a lot since my last blog so, this week, it is all about The Christmas Angel and the village of Peneglos (which, of course, does not exist except on our minds and, I am sure, in the minds of all who have read the book). A few years ago, Marcia was pottering around Dulverton up on Exeter. I'm pretty sure this would have been when she was writing Memories of the Storm. Wandering around the shops she came across one called 'Angels Fly South' in which were all sorts of quirky bits and pieces including the trio in the picture above. Captivated by these enchanting creatures, she bought them and they have been added to our collection of bits and pieces that come out every Christmas. It came as a complete surprise when the one in the middle, whom we had named Auntie Gabriel, insisted on appearing in 'The Christmas Angel' and, with the rest, ended up packed in the bottom drawer by young Jackie. Whenever Marcia decides that there has to be a dwelling here or a village there I am very unhappy unless I feel that there is a good reason why that building or that community could be where she wants it to be. Actually it was the house in The Way We Were that caused most difficulty. Why on earth should there be a group of two or three old cottages that had been knocked into one in the middle of nowhere on Bodmin Moor? There was no sign of any serious mining or quarrying although there was ample evidence on the ground that people lived there - about six thousand years ago. Still, both of those industries resulted in people building in rather isolated spots so quarrying it was. When Marcia wanted a village on the coast which had nothing to do with shipping or fishing I was not that happy. Why would such a village exist? Then we visited Trevone - and there was the proof that we needed. Hence Peneglos, situated above a beach, climbing up a hill with an old manor house at the top. Why was it there? To serve the manor house. What happened to the manor house? It became a convent. I was instructed to place it in a real location between Trevone and Padstow and to draw a map of the village which I did but now I seem to have lost. I will try and find it and, if I do, put it up next week. Then I shall start talking about the next book to be published which will take us down to the banks of the River Tamar, the tradition boundary between Devon and Cornwall. Books - books - books. It was very fortunate that I had written last week's blog on the previous Sunday as otherwise I could well have missed a week. It was nothing very serious but the eyes were playing up a bit and when that happens I try to keep away from computers, televisions and (very sadly) my Kindle. As most of you know, reading books as such are no longer possible for me but the beauty of the Kindle is that I can adjust the type size so that I can read it. Thus I am now an ebook reader but what are ebooks doing to the world of proper books? To answer that we need to know whether ebooks are bought instead of or in addition to paper books. If it means that more people are reading then ebooks are a good thing but if they are another nail in the coffin of the book shops then clearly that is not. From the little research I have been able to make, I am reasonably sure that ebooks are, on balance, a good thing for writers and for everyone else involved in the production of reading matter. Book shops closing is a different matter and there are, I think, two main reasons. The first is that most bookshops are in places where there are less people: out of town shopping supermarkets and so on mean less people in high streets and that creates a problem shared by many small retail shops, not just book shops. The second is that the power of large retailers (supermarkets and on-line) enables them to command discounts which can result in them being able to sell at prices less than most bookshops have to pay their wholesalers. Again this is not just a problem for those selling books. Thanks to the buying power of these huge chains, dairy farmers also suffer from narrowing profit margins and many are going out of business as a result. I am sure there are many other examples. It is always sad when things change and people get hurt but I am not sure you can point the finger of blame at anyone: change happens - sometimes for the better and sometimes for the worse. We all need cheering up at this point and since there are no photographs that can illustrate today's blog, I have made a random choice of some of the pictures I have taken of birds over the years. I digress from where I had meant to go which was to say that as result there really is nothing to report and that is not good news when trying to write a blog. Luckily today (Thursday) the eyes are much better so at least I can offer a few thoughts. From the back of our garden look over the fields to the east and there, almost hidden by trees, you can see the gable end of a cottage in which live David and Debbie Hurst along with two toddlers - both boys - and a couple of dogs. David is a journalist, a very hands-on father and, thanks to getting up early in the morning - and I really do mean early - also finds time to write novels. These are pretty grisly crime stories and it would be wrong to suggest that people who like reading Marcia's books would enjoy David's: they almost certainly wouldn't. However, David's journalism includes articles about a wide variety of people including authors and he has been commissioned to write two about Marcia: one for Women' Own and one for a magazine in Dubai. For the latter he asked both of us to name our 'three favourite authors'. This has proved to be an impossible task. For a start we both read books from many genre. 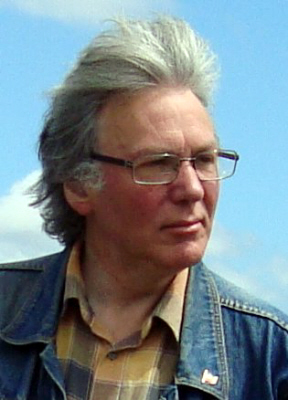 My range includes political theory, detective novels, anthropology, war at sea (factual and fictional), genetics, spy thrillers (from Buchan to Robert Ryan) and so on. Marcia's is even wider as it includes poetry (which I can rarely understand) and many more novelists than I read. So, in the end, we offered him a list of the three last books we had read. Mine: Super Cooperators by Martin Nowak and Roger Highfield; Early One Morning by Robert Ryan and The Flamingo's Smile by Stephen Jay Gould. Marcia's: At the Source by the poet Gillian Clarke; Learning to Dance by Michael Mayne and Cloud Atlas by David Mitchell. Old friends and a farmers' market. So ends another season of signings – although Marcia is speaking at the Authors’ Day to be held in Trematon Hall next month. As you would expect, Marcia meets a lot of old friends at these signings and one such was Bob Mann whom she met in Totnes. How to describe Bob? He plays the tuba but that is the least of his talents. He is a writer: it was Bob who wrote Marcia’s very first review. He is an historian: he and I, with others, have co-authored books on local history. He is a publisher: he owns Longmarsh Press of Totnes. He brought with him a copy of a book he has recently published called ‛Ielfstan’s Place’ written by Richard Girling and first published by William Heinemann in 1981: Longmarsh Press specialises in publishing works about Devon which have been allowed to fall out of print. In this book, Richard Girling presents an imaginative evocation of life in and around the Dartmoor parish of Ilsington, from the time of the area’s first human inhabitants to the early twentieth century. He writes for The Sunday Times and as always his writing is superb and a joy to read. With the signings out of the way. Marcia and I decided we would go to Tavistock on Saturday and see what was on offer at the Farmers’ Market which is held twice a month. The Farmers' Market where you can buy a huge range of goodies all produced locally. There is one special favourite of mine I get here: chicken and chive sausages. I defy anyone to find tastier bread than that found on Hugo Endacott's stall. On the way back we drove up the Lew valley from Chillington to Lewdown. The trees were looking wonderful: autumn colours glowing in the low sun. There are two rivers in west Devon bearing the name Lew. They rise a matter of a few miles apart but one is a tributary of the Torridge which discharges into the sea on the north coast of the county whilst the one I am going to talk about rises on the north west corner of Dartmoor and winds its way through the Lew valley to Marystow where it joins the River Lyd, a tributary of the River Tamar which meets the English Channel at Plymouth. The River Lew is typical of many such which rise on Dartmoor being far smaller than you would expect when compared to the wide flood plain. This is because these rivers can produce very powerful flash floods after heavy rain on the tops. St Peter's at Lewtrenchard where the Rev'd Baring-Gould was Rector for many years and, by the way, where Marcia's God-daughter was married. This photograph was taken back in the spring when the churchyard was awash with primroses, celandine and dandelions. On the way the Lew passes Lewtrenchard. The Domesday book mentions Lew Manor and the ‛modern’ name derives from the Trenchards, who were the lords of the manor in the thirteenth century. Its most famous occupant was the Rev. Sabine Baring-Gould (1834-1924) who, apart from being the Rector of the parish and father of fifteen children, was a scholar and novelist with over twelve hundred published works to his name including hymns of which the best know is probably ‛Onward Christian Soldiers’. Marcia is on her way to Waterstones in Truro for her last signing assignment. Chris Smale represents Transworld in the west country and is driving her down. Even so I expect her to be on her knees when she returns. The sky over Dartmoor just before we sat down to breakfast was delightful. Unfortunately, when it was time for Marcia to leave for Truro the sky was a dreary uniform grey from which a cold mean rain was falling. Generally the signings have been a huge success. Last Saturday morning Marcia and Chris were in Plymouth and the signing there was followed by a wild dash to Exeter through very heavy traffic. Even though Chris knows all the available short cuts the journey took so long that there was no time to stop for any lunch. Her intake on this trip seems to have been two cups of coffee and one croissant: one way of keeping the weight down! There are always high spots during these signings. Two in particular stand out. Once Marcia returned complete with a bunch of roses brought in as a ‛thank you’ by one reader whilst another brought in her dog. ‛I just knew you would want to meet him.’ He was, by all accounts, a very nice dog and Marcia was delighted to be introduced to him. You will not be surprised to learn that there has not been time this week for us to go anywhere or do anything very much. There are, however, a few things to report from the home front. Our pheasants have completely disappeared. Most years whichever male it is that has decided to make the garden ‛his’ during the breeding season hangs around through the winter eating great quantities of expensive corn. Not this year. The sadness is tinged with the pleasant thought that the bird feed costs are much reduced. Last winter we had male blackbirds constantly squabbling just outside the kitchen and one very tame female not above hammering on the door when she felt it was time for a handful of raisins. They always disappear for a while late February or early March but then usually return with the young once they have flown. Not his year, but for the last couple of days there have been three very nervous males dropping in only to fly off at the slightest hint of movement. We shall have to see how that goes. Two new arrivals are two species of fungi that we have never seen before in the garden. How have they arrived? How long have they been lurking under the ground? I have no idea. I think they are rather jolly and I have used one of these photographs on my laptop desktop so as to brighten up my day. Fungi is not my strong point but I am reasonably certain that this is Peziza aurantia otherwise known as orange-peel fungus. If it is then it is not only edible but delicious but I have so little faith in my identification that I won't be having it for lunch. Definitely Marasmius oreades or the fairy-ring champignon.Although not poinonous (unlike Cliticybe rivulosa which often grows alongside it) I understand to be somewhat tasteless. Let me know if you think I am wrong. I have decided to buy some ‛plant root trainers’ and to sow some sweet peas and runner beans in them. I had heard of these only recently but it does seem to be a good idea. Essentially they are are very deep but quite small plastic tubes and the idea is that they ‛train’ the roots to grow longer than usual and avoid the risk of them compacting into a tight ball. ‟Roots! ‛Shun!″ I shall keep you posted. What weather this week! I know that it is very British to go on about the weather but when you live where everything changes so dramatically it is difficult not to. Mind you, those living on the east coast of America where they have had such early heavy snowstorms probably feel the same way. First day in November: the sun is shining and it is so warm that Marcia and I drink our morning coffee outside sitting on the bench on the terrace looking down into the pond garden. Looking down towards Cornwall. The tree to the right is a black mulberry that was given to Marcia by her previous publishers, Hodder Headline, about ten years ago. It is all very odd this year. There is an azalea which has just come into flower. Stupid plant, does it not know that it should be waiting until late February? The azalea isn’t the only early bird – the mahonia too is in full flower. Meanwhile some of the nasturtiums are still blooming as are some gazanias: both plants should have given up a couple of weeks ago. I suppose the most surprising thing was that Marcia picked some sweet peas and put them in a vase on the kitchen table. Sweet peas in November: unheard of. Looking out from the kitchen as I write this (it’s now Wednesday) there is a watery sun but the ‛courtyard’ is still looking pretty good. We are surrounded by wonderful autumn colours. Nothing like the great swathes of maples in Canada, of course, but just as beautiful in a subdued and subtle way. Over the last few weeks we have often woken up to magnificent dawns. Not this morning. The valley was filled with mist and you can barely see the fields opposite the house let alone Dartmoor. It's nice to see the sheep back in this field which has been empty for weeks. Poor Marcia is juggling with lots of things just at the moment. This is making writing more difficult than usual and, on top of everything else, there was a leak in the bathroom which resulted in her study ceiling being badly stained. Dennis Hunt, who has looked after the decoration of the house ever since we bought it, is busy in there painting it. He was working there yesterday as well: stopping the cracks that had developed and I must say he has done a fine job. I had a feeling we might have had to re-plaster parts of it. Because the outside of the house is rendered and painted, Dennis refuses to allow us to grow anything up the walls and absolutely nothing like virginia creeper or ivy. Dictator! Yesterday The Christmas Angel, Marcia’s twenty-first novel written under her own name, was published by Transworld. This should, of course, be a great day: the culmination of twelve months work but it isn’t. Marcia was really finished with this book about eighteen months ago when it was accepted by her editor and, since then, has written another book which is on production (The Sea Garden) and is working on number twenty-three. The really great day is the one on which her editor accepts the manuscript. Then we do celebrate! Transworld, however, never fail to send her a bunch of flowers and so I took this picture as she was unwrapping them yesterday. 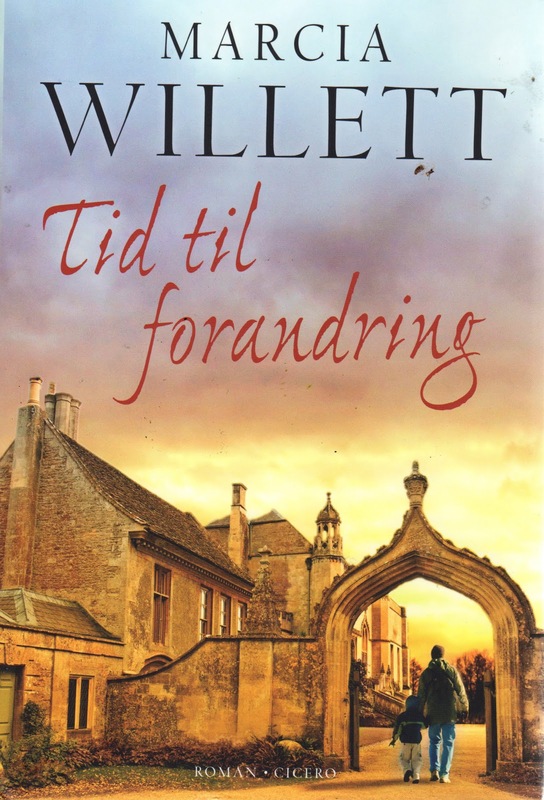 As it happened we received copies of the Danish version of The Christmas Angel at the same time. Here is their cover – a very different ‘take’ on this book! I am told that the title is ‘Time for Change’. The sun was rising over the Okement Valley on Dartmoor when we hauled ourselves out of bed. This was taken from our bedroom window. Today Marcia has driven over to Kingsbridge to sign books at The Harbour Bookshop. We felt that it would be unfair for us all to go as it would have meant Jossie spending far too long in the car. It was not the best of days to be making that journey. The obvious route goes through Cornwood but the centre of the village was closed to traffic. This meant a long diversion onto roads that were extremely busy – it is half term and the west country is full of people down for a few days which is lovely but does cause some problems. Coming back was slow, too. In order to avoid Cornwood, Marcia drove up to Buckfast and over the moor from there. As she put it, ‘The Moor was heaving but it was a lovely sunny trip.’ And, indeed it has been a wonderful day. Tomorrow it will be Book Stop in Tavistock: we shall be going together but the forecast is for some pretty dreadful weather. Marcia and a great friend of ours, Caroline Winterton, enjoying a joke. Marcia and Pat Abrehart, who owns The Harbour Bookshop, with Jayne: one of Marcia's faithful readers. It must have been about three years ago now when Marcia was feeling pretty desperate because we just couldn’t find the location for The Christmas Angel (or, as she titled the book ‛Unpacking the Angel’). The one ‛known’ was that it would be in Cornwall because there was to be a connection with surfing – although a very tenuous one. We had tried the south coast all the way down to the Lizard Peninsula but with no success and the various parts of the north coast had seemed no better until we visited St Endellion for a completely different reason. Well, it was something like that. We were in St Endellion because a great friend of ours is buried there. His widow now lives in Bath and she and Marcia communicate by telephone at least once week. So, having visited the grave and put some fresh wild flowers on it, we had lunch in the farm shop just up the road. Suddenly Marcia realised that this was where two of her characters had met for coffee. It was not quite the centre of things but at least we had a rough idea of where everything would take place. A few days later we – well I – drove down and, for no really good reason, carried on down the A39 (which more or less follows the coast from Bridgewater in Somerset all the way down to the west of Cornwall) through Wadebridge not knowing where I was going to end up. I was getting a little tired of the main road as we approached to turning off to Padstow so I turned right there and carried on until I was nearly in the village. For some reason that thought didn’t appeal so when the road swung round to the right I veered left onto a lane and then right onto an even narrower one. ‛Where are we going?’ asked Marcia. There was only one honest reply. It was, in fact, much later for we found ourselves driving down a steep and narrow lane into Trevone having passed a place at the top where we could have stopped. This was the first glimpse we had of the area that was to dominate our lives for the next few months. The rooks are foraging in a field recently sown with barley. We were to watch the barley grow and to see it harvested. ‛We must go back,’ Marcia had that look so I turned round and back we went. She jumped out of our old camper van and set off down a path towards the cliffs leaving me to prepare coffee. She returned with a big grin on her face and I knew we had struck gold. What both of us found fascinating about this part of the coastline was all the tiny things that we found – tiny things that we could not remember seeing in other places. I will let the pictures explain what I mean. Hundreds - and I mean hundreds - of snails lurking in crevases in walls. More snails clinging to the stalks of various plants. The air in this part of the country is so purse that lichens and mosses are commonpalce. Not quite so welcome was the swarm of these little fellows that we encountered one day towards the end of April although I spent an interesting half hour trying to get a picture. This 'doorway' through one of the walls on the coastal footpath was to play a part in the book. This is the Roundhole. Technically this is a collapsed sea cave. You can see where the sea flows in and out with the tides. The collapsed debris is gradually swept out to sea leaving a round hole that drops from the field above Harlyn Bay down to sea level, a drop of a couple of hundred feet. This, too, plays its part in this novel. A real surprise was to find these mallows scattered about. They were in flower for only a week or two and so would have been very easy to miss. There are many wild flowers on these cliffs as this posy that Marcia pickled demonstrates. It seems such a long time ago but, as I am sure you all realise, from the time when Marcia starts brooding about a book to the time it finds itself on a bookshelf waiting to be bought is usually over two years. 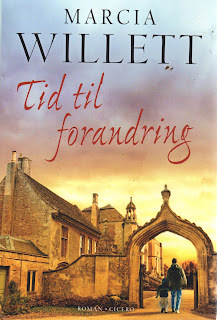 Anyway, publication day will have come and gone before I post my next Friday blog. I think you are all in for a real treat.